With CES fast approaching, it's time for a quick #CESlive check in! We have a few important updates to relay in regards to the awesome show coverage we'll be bringing you from the floor of the biggest electronics and tech show of the year. In case you missed the announcement (and if you did, you should read the press release and watch this video), Mobile Nations is teaming up with Geek Beat to put on #CESlive. We have a big area in South Hall of the Las Vegas Convention Center where we'll be broadcasting a whole bunch of awesome interview from. Between the two teams we'll have THIRTY people at CES - so outside of the live stage we'll be running and gunning the best coverage you'll find at the show. It's going to be awesome. 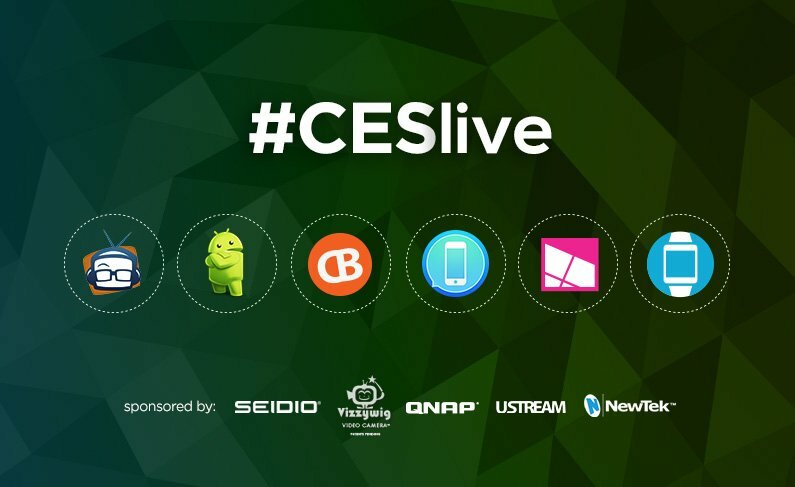 We're happy to announce Seidio, Vizzywig, QNAP, USTREAM and NewTek as sponsors of #CESlive. Huge props to these companies for stepping up to the plate. It takes $$$ to put on a show of this magnitude and we thank them a bunch. You'll be hearing more about them throughout the event, but here's an early shout out. We've been lining up interview guests for #CESlive like crazy, and you'll be hearing directly from many of the BIGGEST and BESTEST companies during the show. We're talking names like General Motors, Gameloft, NVIDIA, LG, Polaroid, HTC, Samsung, HP, BenQ, Pioneer, Nikon, FitBit, Oculus VR and SwiftKey, and that's just name a few. Update #3: WE'RE HAVING A MOBILE NATIONS / GEEK BEAT MEETUP!! We're going to be working our butts off all day putting on #CESlive, but it's Vegas so we have to have fun at night too. To that end we're going to have a Mobile Nations / Geek Beat meetup on the night of Wednesday, Jan. 8. The initial meet up point is Planet Hollywood at the always-tasty Earl of Sandwich. Once there is tasty sandwiches in our belly, we'll head around the corner to the PBR Rock Bar & Grill where we can have some drinks and take on the mechanical bull. It's going to be a riot. Hit up the link below for more details. If you're in Vegas, we'd love to see you there! More Details on the Meet Up! We'll be checking in a couple more times before we make the trek to Vegas to take on CES. In the meantime, get excited. It's going to be a GREAT way to start 2014!